Text: For four months a joint-committee of the Woman’s Municipal League and the People’s Institute has been engaged in an investigation of the cheap amusements of Manhattan Island. The committee has been composed as follows: Michael M. Davis, Jr., secretary of the People’s Institute, chairman; Mrs. Josephine Redding, secretary of the Woman’s Municipal League, secretary; Mrs. R. H. McKelvey, Miss Henrietta B. Rodman, Miss Alice Lewisohn, Mrs. F.R. Swift, Michael H. Cardoza, Charles H. Ayres, Jr., John Collier, and W. Frank Persons. The investigation has been made financially possible through the Spuyten Duyvil branch of the Woman’s Municipal League. The writer has acted as field investigator. Attempt has been made to cover all phases of the cheap amusement problem, excluding from the detailed investigation dance-halls and skating-rinks on the one hand and high-priced theaters on the other. Legal and business aspects have been studied as well as educational and sanitary. The subject-matter has been fourfold: melodrama, vaudeville and burlesque; nickelodeons, or moving picture variety shows; penny arcades; and miscellany. The miscellany are anatomical museums, fake beauty-shows, etc., which are confined to a limited area of the city where they maintain a difficult existence. They can be passed over in the present brief report. What follows sums up the results of the investigation. The whole topography of the cheap-amusement problem has changed within the last six years. To illustrate: the old-time crass melodrama has been in large measure dethroned, crowded out by the cheap vaudeville and the nickelodeon. The cheap vaudeville has spread widely and has become a problem in itself; it plays a fairly constructive role in a few instances, and in several is about the vilest and most brutalizing form of entertainment in New York. Withal, it generally keeps within the bounds of the laws protecting public decency, which are largely matters of interpretation, but only through agitation, hard fighting and a constantly aroused public sentiment can it be kept within bounds. But even the cheap vaudeville has been eclipsed by the tremendously expansive nickelodeon, the number of which in Greater New York, has grown in a few years from nothing to more than six hundred. The nickelodeon is now the core of the cheap amusement problem. Considered numerically it is four times more important than all the standard theaters of the city combined. It entertains from three to four hundred thousand people daily, and between seventy-five and a hundred thousand children. And finally, the penny arcade has sprung into mushroom existence, has proved itself to be irredeemable on the educational side and without the elements of permanent growth in popular favor and has worn out its public. It is now being driven from the field by the nickelodeon. Not only the superficial aspect, but the essential nature of the cheap amusement problem has changed and changed for the better. Constructive elements have entered and triumphantly made good with the public, so that now the cheap-amusement situation offers an immediate opportunity and a rousing challenge to the social worker. The nickelodeon’s the thing, and the story of its development is instructive. Five years ago the nickelodeon was neither better nor worse than many other cheap amusements are at present. It was often a carnival of vulgarity, suggestiveness and violence, the fit subject for police regulation. It gained a deservedly bad name, and although no longer deserved, that name still clings to it. During the present investigation a visit to more than two hundred nickelodeons has not detected one immoral or indecent picture, or one indecent feature of any sort, much as there has been in other respects to call for improvement. But more than this: in the nickelodeon one sees history, travel, the reproduction of industries. He sees farce-comedy which at worst is relaxing, innocuous, rather monotonously confined to horseplay, and at its best is distinctly humanizing, laughing with and not at the subject. Some real drama: delightful curtain-raisers, in perfect pantomime, from France, and in the judgment of most people rather an excess of mere melodrama, and in rare cases even of sheer murderous violence. At one show or another a growing number of classic legends, like Jack and the Beanstalk or Ali Baba and the Forty Thieves, can be seen any night. The moving picture repertoire amounts to tens of thousands, and is amazingly varied. One firm alone in the city has two million feet of “film” stored away until it can be used again as fresh material, after the public has forgotten it. In addition to the moving-picture, the nickelodeon as a rule has singing, and almost invariably the audience joins in the chorus with a good will. Thus has the moving-picture-show elevated itself. But the penny arcade has not elevated itself, and the cheap vaudeville, if anything, has grown worse. The nickelodeon is a family theater, and is almost the creation of the child, and it has discovered a new and healthy cheap-amusement public. The penny arcade is a selfish and costly form of amusement, a penny buying only a half-minute’s excitement for one person. Its shooting-gallery and similar features are likewise costly. In the short-lived pictures there is no time for the development of human interest, but the gist of a murder or of a salacious situation can be conveyed. So the penny arcade has resembled the saloon, from which the family has stayed away; and everything artificial has been mustered in to draw the floating crowd. As for the cheap theater, it has had a false tradition behind it, and managers have taken for granted that a low-priced performance could be given only by an inferior cast. So when the cheap theater has departed from the crudest melodrama it has gone over into inferior vaudeville and has depended on illegitimate methods for its success. This is the rule, although there are exceptions, and vaudeville at best has only a limited interest for the great, basic, public of the working and immigrant classes in New York. But the nickelodeon started with a free field and a marvelous labor-saving device in the moving-picture, and it began above all as a neighborhood institution, offering an evening of the most varied interest to the entire family for a quarter. Thus the nickelodeon grew as solidly as it grew swiftly, and developed a new amusement seeking public, the public that has made the nickelodeon what it is. Right here is found the most significant aspect of the present amusement situation. All the settlements and churches combined do not reach daily a tithe of the simple and impressionable folk that the nickelodeons reach and vitally impress every day. Here is a new social force, perhaps the beginning of a true theater of the people, and an instrument whose power can only be realized when social workers begin to use it. The investigation led almost immediately to constructive opportunities. On the legal side, an anomalous situation was found. In no existing law, state or municipal, was penny arcade or moving picture mentioned. These theaters were grouped by construction as common shows, along with ferris wheels and bicycle carrousels, and were put under the authority of the license bureau. But where the standard theater is regulated in the minutest detail as regards its building requirements, by written law, there is no law and no printed specification for the moving picture show, which plays with fire. The theaters are controlled by the police, in whom responsibility is centered, and who co-operate with the proper departments. But the nickelodeon is controlled by the license bureau, a clerical department, and up to ten months ago it went to all intents and purposes unsupervised. Then popular agitation and the initiative of a hard working official in the fire department, set the city’s machinery at work, and a good deal has been done. The moving picture show is reasonably safe from fire now; it is not yet safe from contagious disease, and the air is often very bad. As a first step toward adjusting the legal situation, the investigation committee framed a bill, which has been introduced by Assemblyman Samuel A. Gluck at Albany, and which has passed the Assembly by a large majority. Barring unforeseen obstacles it will pass the Senate at the present session. This bill provides for the raising of license fees on nickelodeons from $25 to $150 a year, for the placing of this license under the direct control of the police, along with the license for standard theaters, and for the exclusion of school children from nickelodeons during school hours and after eight o’clock at night, except when accompanied by guardians. This bill went to Albany with the endorsement of various civic organizations, the Board of Education, and the Moving Picture Association itself which has shown every desire to co-operate in the improvement of moving picture standards. On the side of co-operation with the moving-picture business looking toward more elevated performances, and even the improvement of the artistic and educational quality and of sanitary conditions through direct competition on a commercial basis, the opportunity is immediate and large. In this field it is probable that the drama machinery of the People’s Institute will be turned to use in some co-operative plan, giving endorsement to the best of the shows and receiving in return the right to regulate their programs. Settlements on their own initiative could do valuable work in this way. The investigation committee, which is to be perpetuated as a sub-committee of the drama committee of the People’s Institute, will in all probability start one or more model nickelodeons, with the object of forcing up the standard through direct competition, of proving that an unprecedentedly high class of performance can be made to pay, and perhaps, in the event of success, of founding a people’s theater of the future. Comments: John Collier was an American social worker working for the New York People’s Institute. 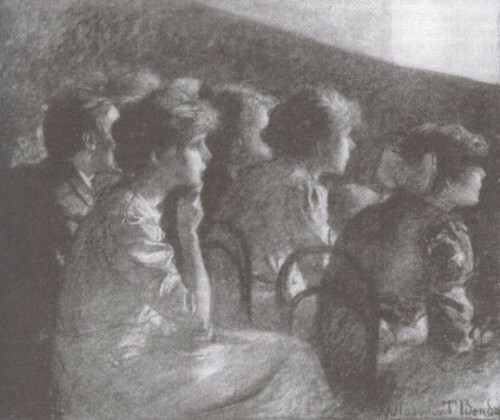 Michael M. Davis of the same organisation later produced an important study of commercial entertainments, including cinema, The Exploitation of Pleasure: A Study of Commercial Recreations in New York City (1911). Charities and the Commons was a weekly journal dedicated to social and charitable themes. Penny arcades would often include moving pictures, usually of the peepshow variety. This entry was posted in 1900s, Journals, USA and tagged Arcades, Audiences, Comedies, Documentary and non-fiction, French films, Hygiene, Industrials, John Collier, Licensing, Melodrama, New York, Nickelodeons, Prices, Singing, Travelogues. Bookmark the permalink.